I’ve recently taken an interest in what plagues Freelancers on a daily basis. Some of the most popular responses I have received have been back/neck pain, headaches and wrist/hand pain. I’ve already covered back/neck pain in my article What About a Stand-Up Desk Workstation and headaches in How to Prevent Stress Headaches. Now I’m onto wrist and hand pain. Last week I started off with an article about The Best Keyboard for Carpal Tunnel and so the last piece of this little ‘pain-free series’ is the best ergonomic mouse for carpal tunnel. So without further ado, let’s jump in. Amazon Affiliate Disclosure: This post contains affiliate links. If you purchase something through one of the links, you won’t pay anymore, but we will get a small commission to help keep us up and running. Thank you and enjoy! You’ve probably heard the words ‘Carpal Tunnel’ from someone you know, or you might actually know someone with Carpal Tunnel Syndrome. But what exactly is it? I broke it down in my last article, The Best Keyboard for Carpal Tunnel, but I’ll give you an overview here as well. Tunnel: well, tunnel. The thing you drive through with your car, but a lot smaller. So, the carpal tunnel is just a round-tube in your wrist that things go through. Why’s carpal tunnel syndrome important? This ‘tunnel’ is important because it houses your median nerve (you know, those things that your brain sends electric currents through so your body can move). This particular nerve is the one that controls your thumb, index, middle and ring finger, so, ya, it’s pretty important. 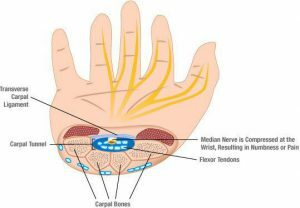 The carpal tunnel is also home to the tendons that move these fingers as well, and they’re most likely the culprit of your pain as someone you used the computer a lot. Why does this cause wrist and hand pain? This problem arises when one of those 3 things mentioned above (carpal tunnel, median nerve, tendons) changes in some way. 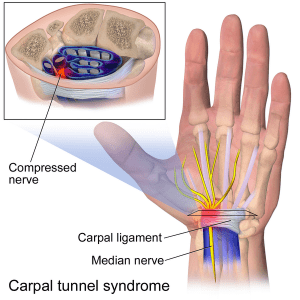 Actual Carpal Tunnel Syndrome (CTS) is caused by a pinch or abnormality in the carpal tunnel. It then pinches the nerve and tendons and causes numbness, pain, or weakness in the fingers and hand. Also, as the carpal tunnel is hard, it doesn’t have any give. If there is any inflammation of the median nerve or the tendons (from overuse like typing on a computer), then this pinches everything in that tunnel and causes pain and other unpleasant symptoms of thumb, finger and hand pain. According to the studies, you most likely do not have carpal tunnel (unless your freelancing job involves power tools and an assembly line). That’s because carpal tunnel syndrome is based on the anatomy of the actual carpal tunnel. What’s most likely causing your finger and wrist pain are the tendons inside that carpal tunnel. Instead of carpal tunnel syndrome, you most likely have tendonitis or repetitive strain injury. Both of these involve swelling of those tendons. This swelling presses on the median nerve, and you can suffer from carpal tunnel syndrome-like symptoms. If you’ve ever heard of tennis elbow, then this is basically that but in the wrist. Too much repetition of a single movement and your body does not have enough time to repair itself causing your hand and thumb pain. How Can the Best Ergonomic Mouse for carpal tunnel syndrome help? If you use a traditional mouse, you repeat the same motion over and over. You also have to move your whole arm and wrist to move the cursor on the screen. Lastly, your wrist is at a fairly unnatural angle for many hours of the day. This probably won’t cause any problems for a week, a month or even a year, but over time these small inconveniences will produce damage that your body can’t repair and you’ll start to have thumb and hand pain. An ergonomic mouse for hand pain returns your wrist to a more natural position which in turn reduces the wear and tear on your tendons. There are other things that ergonomic mice can offer as well like, a thumb rest, different buttons placement, a tracking ball, size changers and vertical tilt personalization. 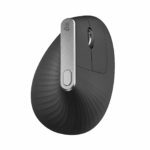 For me, the tracking ball and tilt, or vertical design, are the main components of what I was looking for with the best ergonomic mouse for carpal tunnel syndrome. With traditional mice, you have to physically move the whole mouse to move the cursor on the screen. With trackball ergonomic mice, you scroll the cursor by rolling the trackball under your thumb. You have 360-degree coverage, and it also means less wrist movement, less arm movement, and in the end, less pain. Some people are nervous that they may not get used to a trackball but according to the video on the Kensington website 75% of users get used to their trackballs in less than a week and 69% say they’d never go back to a traditional mouse. The tilt is also hugely important because as I said, traditional mice put your wrist in a weak position. Arm extended and palm down is not the most ergonomically sound position you can be in. 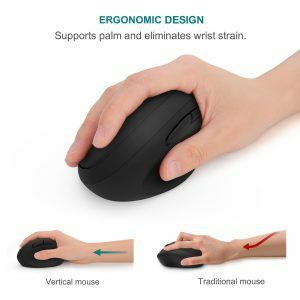 Having a mouse that tilts your palm more towards the center of your body is a much stronger and more natural position for your wrist and hand to be in. This should relieve the pressure from your wrist and reduce hand and thumb pain. What’s the best ergonomic Mouse for Carpal Tunnel syndrome /Repetitive strain injury in 2018? Based on what I’ve seen and used, the most widely regarded mouse as being the best ergonomic mouse for carpal tunnel syndrome is the Logitech MX Ergo. That’s mainly due to its ability to change its tilt to fit your body. As you can see in the photos below, it can go from a 0° to 20° angle and usually just by placing your hand on it and resting your weight naturally, it will find the right tilt by itself. You can also see it comes with the trackball as well, so you don’t have to move it around relieving wrist pain. It’s wireless and comes with a rechargeable battery. You can check out the best mouse for carpal tunnel syndrome on Amazon by clicking below. BUY THE BEST MOUSE FOR CARPAL TUNNEL SYNDROME 2018 AMAZON! All of these features mean that it’s ideal for smaller spaces as well. On stand-up desk workstations, as I mentioned in my article, Sit-Stand Desktop Workstations many of them are difficult to use because of the small keyboard and mouse shelf. However, with this mouse, that isn’t a problem. Andy Slye has done a great job of giving you an overview of MX ergo mouse on YouTube and I’ve included the video here below if you’d prefer that method. Many people complain that the tracking ball is a bit ‘sticky’ and it doesn’t roll as freely as they think it should. If you find this as well you can easily buy a replacement trackball, Logitech Replacement Trackball on Amazon to fix the problem. People have mentioned that this solved their problem. However, if this is your first trackball, then it might be good to have a bit more control over your movements. 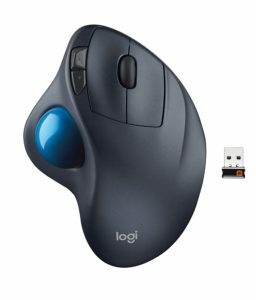 The Logitech Wireless Trackball M570 is incredibly similar to the Logitech MX ergo above however, there are 2 small differences as to why it didn’t take the #1 spot as the best mouse for carpal tunnel. No tilt – As you can see in the photos the base if flat and it’s a 1 size fits all sort of deal. As we know, that’s not always the case. It’s probably great for 80% of people and trying it out it worked for me. However, there will be those out there that the angle just isn’t right and without the tilt, there’s nothing you can do about it. The feel – The MX Ergo comes with a soft plastic that is really nice to the touch. I wouldn’t say that this ergonomic mouse is uncomfortable by any means, but it just doesn’t have the nice feel of the MX Ergo. However, there is one huge upside to this ergonomic mouse over the MX Ergo, and that’s the price. You can get the M570 for less than half the price, at around $30. 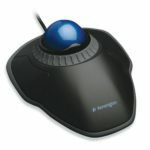 Similar to the Logitech M570 above, this is an ergonomic trackball mouse with 2 buttons and great reviews. The only thing missing here is the tilt of the MX Ergo. 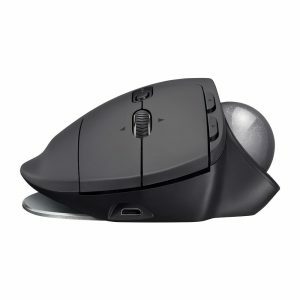 The price, at $30, the feel and the trackball movement are all very solid for an ergonomic mouse like this. You wouldn’t be disappointed in this purchase if it works for you. Like I mentioned above it should work for about 80% of customers and I’ve heard very few negatives here. It’s just that the MX Ergo has upped their game. I didn’t go with a vertical mouse (see photo right) for The Best Computer Mouse for Carpal Tunnel because they don’t come with many of the personalization features of other mice. Also, since this article is aimed at people who work on their computers for a living, vertical mice only give you the most basic features available. Lastly, they do not come with trackballs, so you still have to move your wrist and arm around a lot, which puts extra strain on those joints causing hand pain. 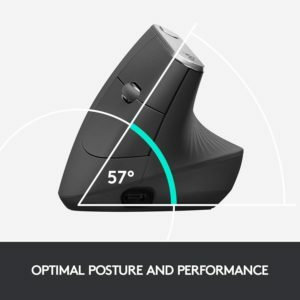 Update: Logitech has released a new ergonomic vertical mouse that is getting incredible reviews, but I haven’t tried it as of yet. The Logitech MX Vertical Advanced Ergonomic Mouse. *Even with all of these claims I would still use a trackball mouse. The reducing muscle strain by 10%, trackball mice don’t require muscle strain. 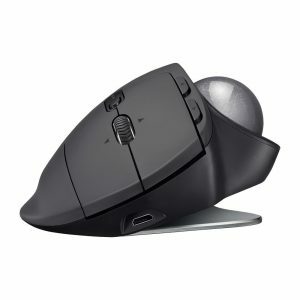 The 4x less movement, trackball mice don’t require movement, and the MX Ergo comes with all of the other features as well. For now, this would be my option for the best vertical mouse for carpal tunnel syndrome. It would also be a solid option for the best mouse for hand pain. I know the price tag of this carpal tunnel mouse might be a bit high for ‘just‘ a mouse, but let’s think about this. You use your mouse 8 hours a day. If it can help you be pain-free for 1/3 of your life, isn’t $90 worth it? I personally put chairs, desks, mice, and keyboards all into the same category. Skimping on them might only cause minor hand and thumb that you can overlook today or tomorrow, but minor problems over 20 years can become catastrophic and lose you both business and money in the long run. That’s not even taking into account the time lost with loved ones because your wrists and hands hurt and you can’t play with your kids/grandkids. This website, Healthy Freelancers, is dedicated to putting you in the driver seat of your health and giving you the best opportunity to lead a long, prosperous freelancing career. If you’re just getting started out in your Freelance Translation Career head over and read How to Become a Freelance Translator Without a Degree where I break down the process I went through to get to where I am today. Lastly, if you’re interested in more ergonomic products for Healthy Freelancers and pain-free work, then check out my Free Ergonomic Home Office guide! It lists the top5 ergonomic office products on the market in 2018. They’re perfect for any freelance home office! You can also check out the Ultimate Buyers Guide for Stand-up Computer Desks! There’s no better time jump on board. 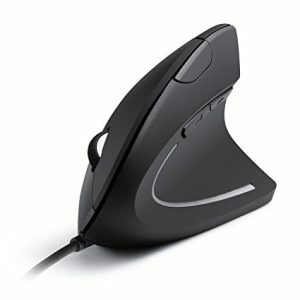 What do you think about the best ergonomic mouse for carpal tunnel? What’s your favorite ergonomic mouse? I found this post very relevant and helpful. As a blogger, I spend large portions of my day in front of a computer and have recently developed symptoms of repetitive strain injury. I’ve been researching various ways to improve the ergonomics of my work environment. I will definitely look into this ergonomic mouse recommendation. If a $90 mouse improves my condition, it’s a cheap fix and very worth pursuing. Thanks for the info! I appreciate you taking the time to leave a comment. There are a lot of ways to help reduce the strain that we put on our wrists typing all day. You might actually be interested in an article I wrote: The Best Keyboard for Carpal Tunnel – Pain-free typing. It would go perfectly with the mouse that you’re looking at. If you ever have any questions please don’t hesitate to ask. Hi there. I just finished reading your article about the ergonomic mouse and found it very interesting. I just wanted to drop you a quick comment to say thanks. I work a full time job, using computers all day and then run a business from home using a computer too. I have to do quite a lot of clicking in the job that I’m in as I monitor CCTV cameras. I often get pain in my wrist and hand. I guess this could be the reason! I will certainly take a closer look at your recommendations here. I appreciate you stopping by and leaving a reply. That repition, 100’s of times per day can really be nasty on the smaller joints in your body. I don’t think you’re alone with wrist pain and that’s why I felt I should write about it. Also, typing doesn’t help that repition either so you might want to look at my article: The Best Keyboard for Carpal Tunnel – Pain-free typing. It touches on many of the same topics but for a little different reason. If you have any questions please, let me know. Happy Freelancing! As a developer and a blogger, I spend many times in front of a PC/Laptop, moving a mouse around… I would like to try this mouse because my primary objective is to avoid CTS completely. It’s good that it is wireless and it can be used on both desktops and laptops equally. One mouse to conquer them all! Thanks for a very detailed suggestion! 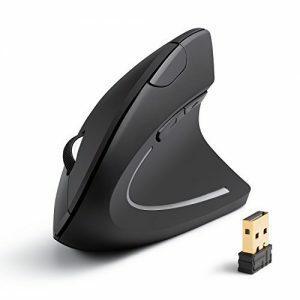 This mouse would be perfect for you! If you’re really worried about CTS or RSI than you could also take a look at an articles I wrote about a great ergonomic keyboard The Best Keyboard for Carpal Tunnel – Pain-free typing. It helps to relieve strain and pressure on your wrist as well. If you ever have any questions please don’t hesitate to ask. Thank you for leaving a comment! Happy Freelancing! Thanks so much. I really got a good idea of the best mouse for me. I know that after a few hours on the computer my hand gets a little numb. I didn’t know that buying a better mouse could help me. Now you’ve done all the work for me and I will get a track ball mouse. You did give a lot of choices. I’ll have to save this article so I can review my options. I’m glad you got some use out of the article. If I were to choose only one, I would definitely go with Logitech MX Ergo as it’s the best all around mouse that should hopefully help with the numbness in your hand. If you have any questions, please, let me know and thank you for stopping by! This is a very useful information. My 9-to-5 job require me to sit in front of my laptop almost full time every day, and I also have many freelancing side job to do at night and weekend. I’m starting to feel some pain in my thumbs with my current mouse. I’m in the same boat as you as I work on my laptop and computer most hours of the day. Switching to a track pad might help in the short term but it’s also not ergonomically very sound is you’re still moving your wrist and arm around. Also, as you said, using a trackpad for a long time is quite uncomfortable. I’d definitely recommend getting an ergonomic mouse when you can. Working online can cause some health problems, thanks for letting us all know about Carpal Tunnel Syndrome. I heard about the hand and wrist problems caused by continually working on computer. Great suggestion of using special mouse, this can really help in a great way. At the same time I would like to suggest to do some wrist movements within the interval of 15-20 minutes. Thank you for stopping by and your suggestion of wrist movements and exercises is great! I’ll definitely look into it and see what I can find. Thank you again! I do a lot of work on my computer and I also use a portable laptop desk. And, I have had issues with carpel tunnel syndrome. As you said, the mouse shelf is not very big, so having a mouse with a track ball is important for me. 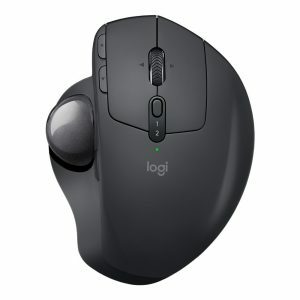 I like what you have to say about the Logitech MX Ergo, but I do have a question. If it tilts from 0 to 20 degrees to adjust to your hand position, how does it stay in place? Or does it keep shifting the degree of tilt depending on your position and movements? The mouse tilt stays in place do to the weight of your hand. Usually just placing your hand on the mouse it will find the right tilt and if it moves a little that’s probably for the best as that’s where you’re most comfortable. If we sit a little differently or are at a different angle, ergonomically, we’d want our mouse to be at a different angle. Thank you for the question and stopping by! I haven’t used a trackball mouse in a few years since I am mostly on a laptop I know you still use a wireless mouse on a laptop. I just prefer the trackpad sometime you know? I can say I do like trackballs better than regular mice though mostly because a regular mosuuae has a small range of motions and constantly picking the mouse up readjust the mouse. To be honest that gets kind of annoying to keep readilsting the mouse all the time. I actually think soon I will have to invest in one of these models. I actually do agree with you on the fact that $90 may be steep for some but like you said it is better to invest the $90 so the wear tear don’t get you down the road. I can say that when it comes to minor tears over time they become more serious if you don’t take the precautions to actually fix the problem. It is just like a chair or a bed if you aren’t comfortable in it and you hurt from being in it get something better I’d rather be safe than sorry. I appreciate your well-thought out comment. I can’t stand having to pick up the mouse either whenever I run out of room on the mouse pad. It’s a small thing but a dozen times a day, and it gets to be quite annoying. You’re absolutely spot on about the chair and bed. It’s definitely worth spending a little more now, so you’re not in pain later and having to pay for massages and extra visits to the doctor. Let me know if there’s anything I can do for you. Take care and thank you for stopping by. A decade ago I switched to left hand mousing because of CT. Any vertical mice for Lefty? 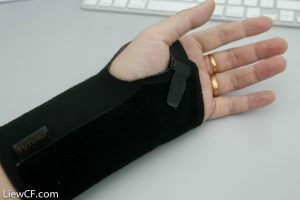 I had carpal tunnel operation more than 6 years ago and suffer from very sore right hand and wrist. I recently bought the ergonomic vertical mouse but is a little uncomfortable. Not sure what ergonomic mouse and keyboard to use while working to avoid so much pain. Can you recommend me which one would be better? 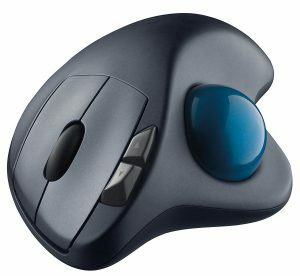 Have you tried a mouse with a scroll ball yet? I’ve found that a lot of carpal tunnel pain comes from moving your entire arm and having a stiff wrist. However, with a scroll ball much, if not all, of that movement is eliminated. It takes a bit to get used to (about a week) but after that, you probably won’t even notice. At least that was my experience. I hope you find what you’re looking for. Thank you for stopping by! I’ve heard about the ergonomic Mouse and have seen few people complain of CTS but your post has provided the best description and analysis on the causes and you’ve critically handled the topic will great and wonderful information. Thanks, I believe I should get one of those mouse for myself, health is wealth indeed! Thanks for the article. The irony is that I bought myself a vertical mouse just like the Anker one and yesterday I got this pain in the base of my little finger and I am using the mouse for two months.